Fashion Inspiration by 3C Style, Photography of 3C Style by her Hubby, Makeup by Emmanuelle Rochefort, Flower photography by Darren, collage compiled by Roda. This tiny relative of the English bluebell is native to Algeria. It is only a few cm tall in good light in its native North Africa but as it flowers in mid-winter it tends to get drawn up in the poor light of the British winter. I find it easy to grow in a pot in a cold greenhouse and it s nice to have these flowers from January onwards. The bulbs are dormant in summer and like to be warm and dry. I bears some resemblance to the Autumn flowering H. lingulata, also from North Africa but with entirely lilac-blue flowers. The largest flowered of the Peacock Moraeas ( gigandra literally meaning ‘big flower’). It is found wild in the Northwestern cape of South Africa and is endangered there. Thankfully it thrives in cultivation in areas with mild winters provided it has a dry summer when the corms are dormant. I find it easier to flower than most of the peacock moraea, possibly because the corms seem less prone to splitting into several smaller corms. Thelymitra tuber dormant in July. Blue Orchids are rare. This beautiful colour is shared by a few of the Australian Sun Orchids. As the name suggests, the flowers only open on warm sunny days. Here in the UK in recent years we have been lucky to have good weather in April and May when these flower. These are terrestrial orchids, spending the hot summer months as dormant underground tubers before sprouting again in the autumn. They are surprisingly easy to grow in a cool greenhouse here in the UK. 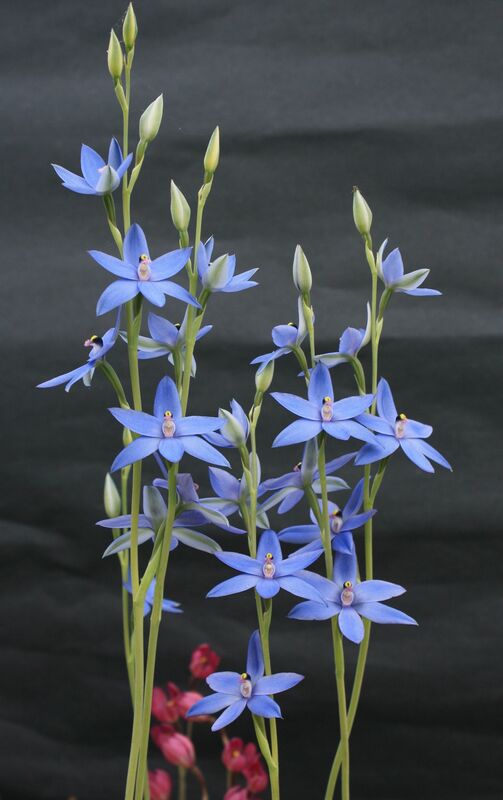 This Sun Orchid is a hybrid that arose in cultivation. Though smaller than the blue one above it has the outstanding feature of possessing the most amazing scent of roses! I wrote about Moraea villosa in detail last month but Dominique and I have been working on a special project using several Moraea species including this and the M. gigandra above. We thought these striking flowers would look good printed on a scarf. Time constraints meant that I could not draw new art specifically for a scarf but I was part way through drawing a mixed composition of these species anyway (which may be complete for next month). I only had flowers as of yet, and no foliage, which was ideal for scarf purposes but unfortunately the composition did not work well. So I carefully moved individual flowers around using Paintshop Pro to make a composition that worked. I even drew two extra flowers on separate paper to add to the composition. We hope to show a completed scarf in a future edition! This was SO much fun to do. See Dominique’s post over at 3C Style for more images and information. I love your post Darren. You, your flowers and drawing are so inspiring. And I like that you explain how you used Paintshop Pro to make a composition that worked. It is such a pleasure to collaborate with you on this special project. I can’t wait to style the two scarves. Wow that illustration is just divine! Aww thank you Katie 🙂 This brightened up an otherwise trying day. Of course but I will not accept payment. It would be a gift to a friend. I love giving people plants as gifts. If he is posted within europe it should be no problem to send them. Thank you so much Sarah😍. All of us need more time to create. So many ideas! Stunning flowers, my friend. You provide just the right inspiration for the rest of the group. Flowery hugs! Thank you for your lovely comment Gill. I can’t claim credit for the idea as it was dreamed up by Dominique and Roda before Lisa and I came on board. So happy to be part of this😄. I love orchids! I love learning more about these beautiful works of nature. Thank you for adding so much joy. Seriously. This collaboration makes me so happy. How are you my dear lady?